What Do They Do to See if You Have Endometriosis? What Will Happen if Endometriosis Is not Treated? Which Exercise Is Best for Weight Loss? What Exercise Burns the Most Belly Fat? This page contains the ODAC roster, which lists the current members and the current number of vacancies for the committee. Pediatric Exclusivity Statistics updated list. The list has been updated through December 2017. The author does not take over any guarantee for the topicality, the correctness, completeness or quality of the information, made available. Liability claims against the author, concerning damage of idealistic or of material kind, which was caused by the use or not use of the presented information and/or by the use of incorrect and incomplete information, are in principle impossible, so far as not a deliberate or roughly negligent fault can be proved on the part of the author. The documents and graphics on this Web site can be affected by technical inaccuracies or misprints, for which we don't assume any liability. Furthermore,quotation from a book or the incidental capturing of copyrighted material in a segment of a MCQ should be considered as "FAIR USE".It is only for nonprofit educational purposes.The display is a regular part of the systematic instructional activities of this non-profit educational website and is meant entirely as help to solve the ever-challenging MCQs.Due respect has been given to great medical authors and their names displayed prominently alongside quotations/pictures or paragraphs. Blunt trauma secondary to motor vehicle accidents, motorcycle accidents, falls, assaults, and striking of pedestrians remains the most frequent mechanism of abdominal injury. Penetrating abdominal wounds are usually caused by either gunshot or stab wounds and by a significantly smaller number of shotgun wounds. Based on the high frequency of intra-abdominal organ injury after gunshot wounds, mandatory abdominal exploration, with the rare exception of tangential and superficial wound trajectories restricted to the right upper quadrant, remains the standard form of management. Stab wounds to the abdomen, however, carry a significantly lower risk of intra-abdominal organ injury than do gunshot wounds, and several studies have recently favored a more selective approach, as opposed to mandatory exploratory laparotomy. The impetus for nonoperative management of solid organ injury in stable blunt trauma patients has expanded to penetrating trauma as well. With improved imaging, more stable patients sustaining a single solid organ injury after stab and gunshot wounds to the abdomen will be treated conservatively. The diagnostic approach differs for penetrating trauma and blunt abdominal trauma. As a rule, minimal evaluation is required before laparotomy for gunshot or shotgun wounds that penetrate the peritoneal cavity, because over 90% of patients have significant internal injuries. In contrast to gunshot wounds, stab wounds that penetrate the peritoneal cavity are less likely to injure intra-abdominal organs. Hemodynamically stable patients sustaining blunt trauma are adequately evaluated by abdominal ultrasound or CT, unless other severe injuries take priority and the patient needs to go to the operating room before the objective abdominal evaluation. In such instances, DPL or focused abdominal sonography for trauma (FAST) is usually performed in the operating room to rule out intra-abdominal bleeding requiring immediate surgical exploration. Hemodynamically stable blunt trauma patients are evaluated by ultrasound in the resuscitation room, if available, or by DPL to rule out intra-abdominal injuries as the source of blood loss and hypotension. The spleen is the intra-abdominal organ most frequently injured in blunt trauma. Suspicion of a splenic injury should be raised in any patient with blunt abdominal trauma. History of a blow, fall, or sports-related injury to the left side of the chest, flank, or left upper part of the abdomen is usually associated with splenic injury. The diagnosis is confirmed by abdominal CT in a hemodynamically stable patient or during exploratory laparotomy in an unstable patient with positive DPL findings. The small bowel is the most frequently injured organ after penetrating injuries.The colon is the second most frequently injured organ after gunshot wounds and the third after stab wounds to the abdomen. Suspicion of a splenic injury should be raised in any patient with blunt abdominal trauma. More than 70% of all stable patients are currently being treated by means of a nonoperative approach. The classic criteria for nonoperative treatment include hemodynamic stability, negative abdominal examination, absence of contrast extravasation on CT, absence of other clear indications for exploratory laparotomy or associated injuries requiring surgical intervention, absence of associated health conditions that carry an increased risk for bleeding (coagulopathy, hepatic failure, use of anticoagulants, specific coagulation factor deficiency), and injury grade I to III. Recent series have also indicated that nonoperative management should be performed in patients older than 55 years, those with a large hemoperitoneum, and patients with injury grades IV and V, which in the past have been relative contraindications. Splenectomy is indicated for hilar injuries, pulverized splenic parenchyma, or any injury of grade II or higher in a patient with coagulopathy or multiple injuries. The authors use autotransplantation of splenic implants to achieve partial immunocompetence in younger patients.Drains are not used. Partial splenectomy can be employed in patients in whom only the superior or inferior pole has been injured. Hemorrhage from the raw splenic edge is controlled with horizontal mattress sutures, with gentle compression of the parenchyma.As in repair of hepatic injuries, in splenorrhaphy hemostasis is achieved by topical methods (electrocautery; argon beam coagulation; application of thrombin-soaked gelatin foam sponges, fibrin glue, or BioGlue), envelopment of the injured spleen in absorbable mesh, and pledgeted suture repair. Postsplenectomy sepsis is caused by encapsulated bacteria, Streptococcus pneumoniae, Haemophilus influenzae, and Neisseria meningitidis, which are resistant to antimicrobial treatment. In patients undergoing splenectomy, prophylaxis against these bacteria is provided via vaccines administered optimally at 14 days. * Advance one grade for multiple injuries up to grade III. 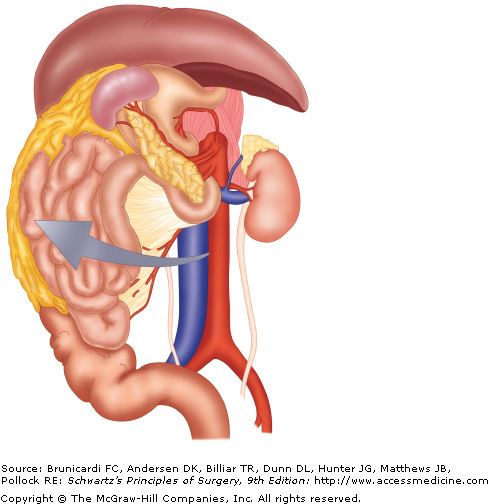 Abdominal exploration in adults is performed using a generous midline incision because of its versatility. For children under the age of 6, a transverse incision may be advantageous. Making the incision is faster with a scalpel than with an electrosurgical unit; incisional abdominal wall bleeding should be ignored until intra-abdominal sources of hemorrhage are controlled. Liquid and clotted blood is evacuated with multiple laparotomy pads and suction to identify the major source(s) of active bleeding. After blunt trauma the spleen and liver should be palpated and packed if fractured, and the infracolic mesentery inspected to exclude injury. In contrast, after a penetrating wound the search for bleeding should pursue the trajectory of the penetrating device. If the patient has an SBP of <70 mmHg when the abdomen is opened, digital pressure or a clamp should be placed on the aorta at the diaphragmatic hiatus. After the source of hemorrhage is localized, direct digital occlusion (vascular injury) or laparotomy pad packing (solid organ injury) is used to control bleeding .If the liver is the source in a hemodynamically unstable patient, additional control of bleeding is obtained by clamping the hepatic pedicle (Pringle maneuver) .Similarly, clamping the splenic hilum may more effectively control bleeding than packing alone. When the spleen is mobilized, it should be gently rotated medially to expose the lateral peritoneum; this peritoneum and endoabdominal fascia are incised, which allows blunt dissection of the spleen and pancreas as a composite from the retroperitoneum . Pancreatic injury is rare and accounts for approximately 10% to 12% of all abdominal injuries. The great majority of such injuries are caused by penetrating mechanisms and are often associated with significant injuries involv-ing other intra-abdominal organs. Blunt trauma to the abdomen caused by a direct blow or seat belt injury may compress the pancreas over the vertebral column and result in pancreatic disruption. Major abdominal vascular injuries are present in more than 75% of cases of penetrating pancreatic trauma, and injuries to solid organs and hollow viscera are common after blunt trauma. Isolated pancreatic injuries are rare. Hemobilia is defined as bleeding into the biliary tree from an abnormal communication between a blood vessel and bile duct. It is a rare condition that is often difficult to distinguish from common causes of gastrointestinal bleeding. The most common causes of hemobilia in modern times are iatrogenic trauma, accidental trauma, gall-stones, tumors, inflammatory disorders, and vascular disorders. Portal venous bleeding into the biliary tree is rare, minor, and self-limited unless the portal pressure is elevated. Arterial hemobilia, the most common source, can be dramatic, however. Clinical sequelae of hemobilia are related to blood loss and the formation of potentially occlusive blood clots in the biliary tree. The classic triad of symptoms and signs of hemobilia are upper abdominal pain, upper gastrointestinal hemorrhage, and jaundice. When hemobilia is suspected, the first evaluation is upper gastrointestinal endoscopy, which rules out other sources of hemorrhage and may visualize bleeding from the ampulla of Vater. Upper endoscopy is only diagnostic of hemobilia in about 10% of cases, however. If upper endoscopy is diagnostic and conservative management is planned, no further studies are necessary. Ultrasound or CT may be helpful in demonstrating intrahepatic tumor or hematoma. Evidence of active bleeding into the biliary tree may be seen on contrast-enhanced CT in the form of pooling contrast, intraluminal clots, or biliary dilation. CT may also show risk factors associated with hemobilia, such as cavitating central lesions and aneurysms. Arterial angiography is now recognized as the test of choice when significant hemobilia is suspected and will reveal the source of bleeding in about 90% of cases. Cholangiography demonstrates blood clots in the biliary tree, which may appear as stringy defects or smaller spherical defects. The latter may be difficult to distinguish from stones. Sabiston:- Gastric injuries often result from penetrating trauma. Less than 1% of such wounds are due to blunt trauma secondary to motor vehicle accidents, falls, cardiopulmonary resuscitation, or interpersonal violence. Most penetrating wounds are treated by débridement of the wound edges and primary closure in layers. 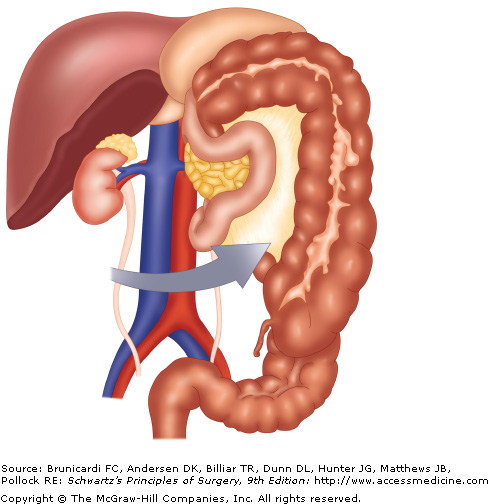 Injuries with major tissue loss may best be treated by gastric resection. During initial evaluation a nasogastric tube should be inserted, and if the aspirate is positive for blood, injury to the stomach should be suspected. It has been noted that splenic absence provides a relative dead space in the left upper quadrant, which often becomes occupied with blood clot or serum, creating a potential for subphrenic abscess. A left medial visceral rotation is used to expose the abdominal aorta. A right medial visceral rotation is used to expose the infrahepatic vena cava. Focused assessment of the sonographic examination of the trauma patient (FAST) is a rapid diagnostic examination to assess patients with potential thoracoabdominal injuries. The test sequentially surveys for the presence or absence of blood in the pericardial sac and dependent abdominal regions, including the right upper quadrant (RUQ), left upper quadrant (LUQ), and pelvis. Surgeons perform FAST during the American College of Surgeons’ advanced trauma life support (ATLS) secondary survey. 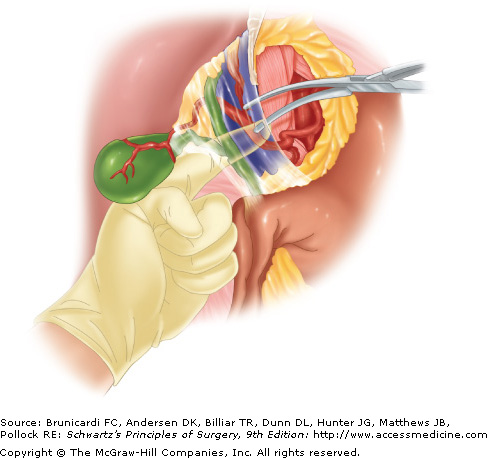 Although minimal patient preparation is needed, a full urinary bladder is ideal to provide an acoustic window for visualization of blood in the pelvis. The technique of performing FAST is well documented. 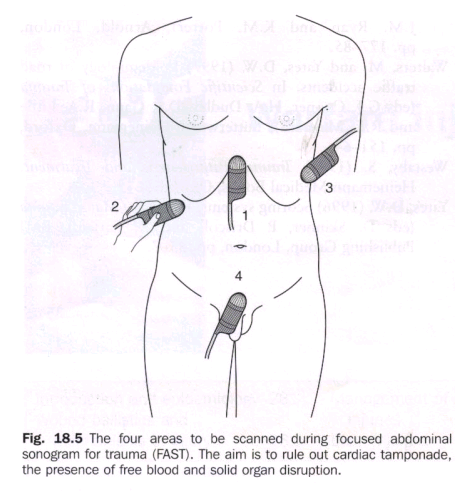 US transmission gel is applied to four areas of the thoracoabdomen, and the examination is conducted in the following sequence: pericardial area, RUQ, LUQ, and pelvis ( Fig. 13-3 ). A 3.5-MHz convex transducer is oriented for sagittal views and positioned in the subxiphoid region to identify the heart and examine for blood in the pericardial sac. Normal and abnormal views of the pericardial area are shown in Figure 13-4 . The subcostal image is not usually difficult to obtain, but a severe chest wall injury, a very narrow subcostal area, subcutaneous emphysema, or morbid obesity can prevent a satisfactory examination. Both of the latter conditions are associated with poor imaging because air and fat reflect the wave too strongly and prevent penetration into the target organ. If the subcostal pericardial image cannot be obtained or is suboptimal, a parasternal US view of the heart is performed. It can be done expeditiously and is as accurate as DPL in detecting hemoperitoneum. It can also evaluate the liver and the spleen once free fluid is identified; however, this is not its main purpose. Portable machines can be used in the resuscitation area or in the emergency department in a hemodynamically unstable patient without delaying the resuscitation. Another advantage of ultrasound over DPL is its noninvasiveness. No further workup is necessary after a negative ultrasound in a stable patient. CT of the abdomen usually follows positive ultrasound findings in a stable patient. The advantages and disadvantages of abdominal ultrasound are listed in Box 20-3 . Its sensitivity ranges from 85% to 99% and its specificity from 97% to 100%. CT is the most frequently used method to evaluate a stable blunt abdominal trauma patient. The retroperitoneum is best evaluated by CT. The indications and contraindications for abdominal CT are listed in Box 20-4 . The drawback of CT is the need to transport the patient to the radiology department.CT also evaluates solid organ injury, and in a stable patient with positive ultrasound findings, it is indicated to grade organ injury and to evaluate contrast extravasation. If contrast extravasation is seen, even with minor hepatic or splenic injuries, exploratory laparotomy or, more recently, angiography and embolization are indicated. Another indication for CT is in the evaluation of patients with solid organ injuries initially treated nonoperatively who have a falling hematocrit. The most important disadvantage of CT is its inability to reliably diagnose hollow viscus injury ( Box 20-5 ). Usually, the presence of free abdominal fluid on CT without solid organ injury should raise suspicion for mesenteric, intestinal, or bladder injury, and exploratory laparotomy is often warranted. DPL is a rapid and accurate test used to identify intra-abdominal injuries after blunt trauma in a hypotensive or unresponsive patient without obvious indication for abdominal exploration. Standard criteria for positive DPL findings in blunt trauma include aspiration of at least 10 mL of gross blood, a bloody lavage effluent, a red blood cell count greater than 100,000/mm3, a white blood cell count greater than 500/mm3, amylase level greater than 175 IU/dL, or detection of bile, bacteria, or food fibers. The indications and contraindications for DPL are listed in Box 20-2 . DPL is highly sensitive to the presence of intraperitoneal blood; however, its specificity is low, and because positive DPL findings prompt surgical exploration, a significant number of explorations will be nontherapeutic. Blunt hepatic injuries in hemodynamically stable patients without other indications for exploration are best served by a conservative, nonoperative approach. These stable patients without peritoneal signs are better evaluated by ultrasound, and if abnormalities are found, a CT scan with contrast should be obtained In the absence of contrast extravasation during the arterial phase of the CT scan, most injuries can potentially be treated nonoperatively. The classic criteria for nonoperative treatment of liver injuries include hemodynamic stability, normal mental status, absence of a clear indication for laparotomy such as peritoneal signs, low-grade liver injuries (grade I-III), and transfusion requirements of less than 2 units of blood. Recently, these criteria have been challenged and a broader indication for nonoperative management has been used. It has been demonstrated that most of these patients are monitored by serial hematocrit and vital signs rather than by serial abdominal examinations, which is the reason why intact mental status is not the sine qua non for nonoperative management. Furthermore, if the hematocrit drops, most patients will undergo a repeat CT scan to evaluate and quantify the hemoperitoneum. The overall reported success of nonoperative management of blunt hepatic injuries is greater than 90% in most series. Breaking it down by injury grade, the success rate of nonoperative treatment of injury grades I to III approaches 95%, whereas for injury grades IV and V the success rate decreases to 75% to 80%. With the use of angiography and superselective embolization in patients with persistent bleeding, the success rate may in fact be higher. For patients undergoing DPL evaluation, laboratory value cutoffs are different for those with thoracoabdominal stab wounds and for those with standard anterior abdominal stab wounds (see Table 7-6). An RBC count of >10,000/L is considered a positive finding and an indication for laparotomy; patients with a DPL RBC count between 1000/L and 10,000/L should undergo laparoscopy or thoracoscopy. Patients with stab wounds to the right upper quadrant can undergo CT scanning to determine trajectory and confinement to the liver for potential nonoperative care.Those with stab wounds to the flank and back should undergo triple-contrast CT to detect occult retroperitoneal injuries of the colon, duodenum, and urinary tract. Sabiston:-Penetrating colon injuries requiring resection (colostomy versus primary anastomosis) were recently evaluated in a prospective multicenter study. The type of colon management was not found by multivariate analysis to be a risk factor for abdominal complications. The authors concluded that once resection is necessary, the surgical method of colon management does not affect the incidence of abdominal complications, irrespective of associated risk factors, and that primary anastomosis should be considered in all patients. This entry was posted on June 3, 2011 at 1:53 pm	and is filed under Medical. Tagged: AIPGMEE MCQs, All india MD/MS entrance exams MCQs, All india MD/MS exams MCQs, Medical MCQs, Multiple choice questions, pg mcqs, PGMEE MCQs, Surgery MCQs, Trauma MCQs. You can follow any responses to this entry through the RSS 2.0 feed. You can leave a response, or trackback from your own site. First time i am looking this site.Its excellent piece of work. Impressive issues listed here. We are incredibly pleased to search this post. Thanks a great deal and I am looking ahead to call a person. Might you kindly lower me a email? your notes have been immensly helpful.thanks a lot. glad studying your article. But wanna statement oon few common issues, The site taste is wonderful, the articles is in point of facdt excellent : D.
you and also friends should locate the Order of the Rock. or weblog posts on this kind of space . Exploring in Yahoo I at last stumbled upon tҺis site. that I’ve ɑn incredibⅼy exceⅼlent uncanny feeling I found out just what I needed. web site and give іt a look regularly. rsss feed and I hope you write once more soon! I loved as much as you’ll receive carried out righht here. The sketch is attractive, your authored subject mawtter stylish. stake or marker within the center or perhaps your desired building area. top use of the swimming pools.